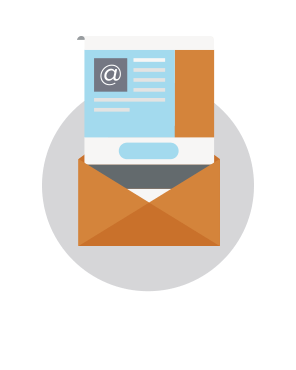 As always, we hope to inspire you with this roundup of emails. 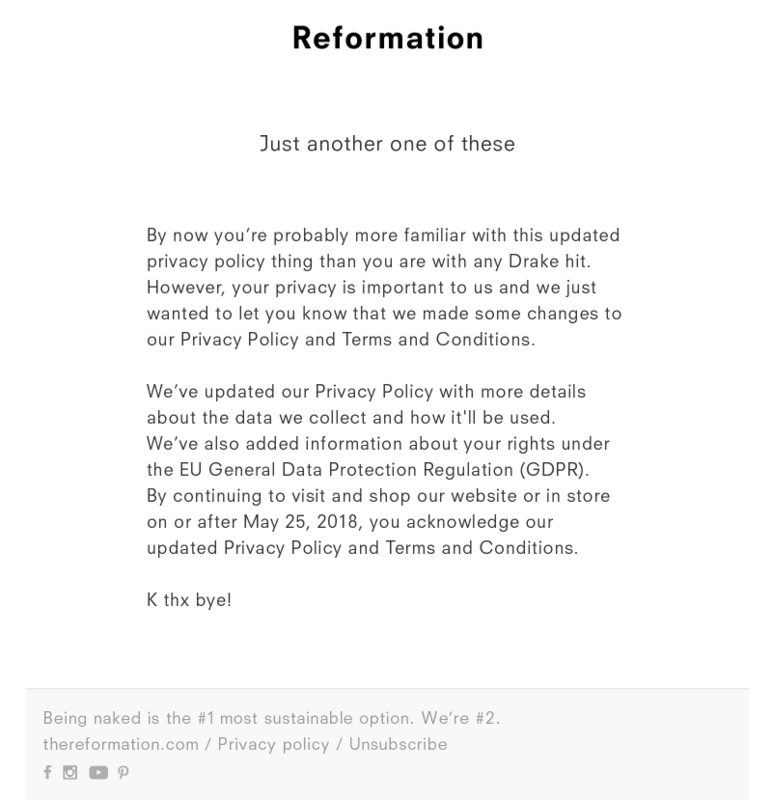 So, let’s have a little GDPR fun! GDPR is the General Data Protection Regulation, a privacy law established by the European Union “designed to harmonize data privacy laws across Europe, to protect and empower all EU citizens data privacy and to reshape the way organizations across the region approach data privacy.” In other words, instead of having different privacy laws in each EU country, now there’s an EU-wide standard that’s enforceable as of May 2018. 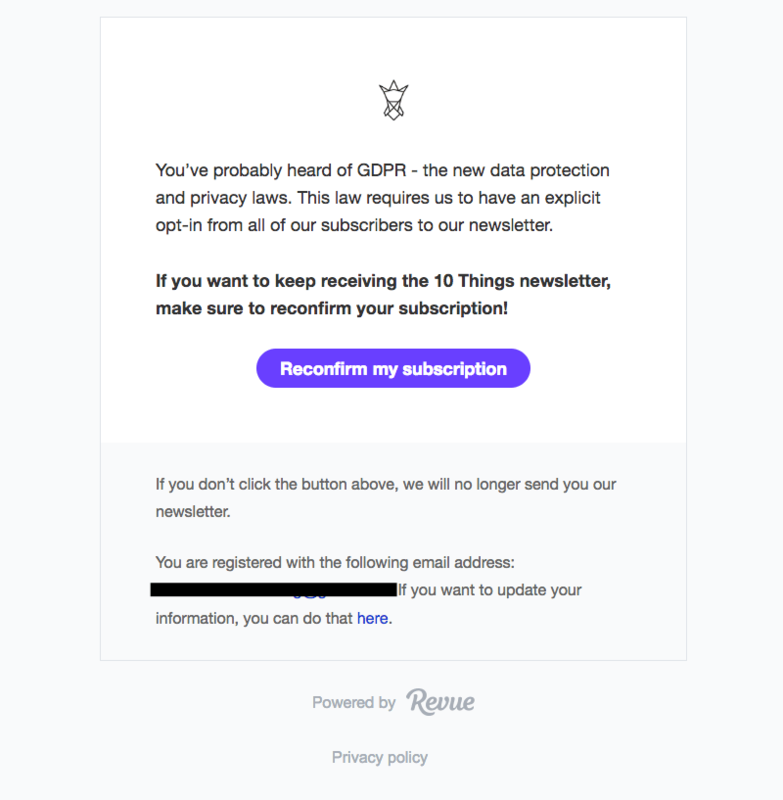 In the email world, companies with EU-based subscribers need to make sure they’re GDPR compliant. 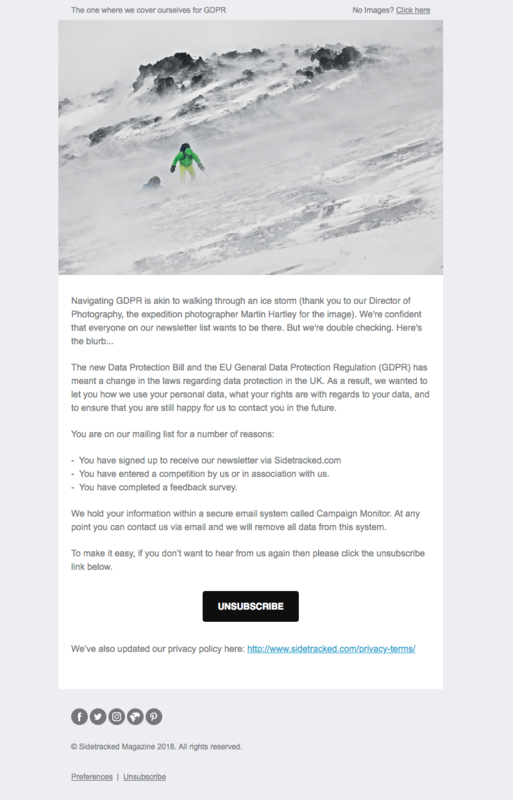 This resulted in, as you’ve noticed, a massive influx of GDPR emails. 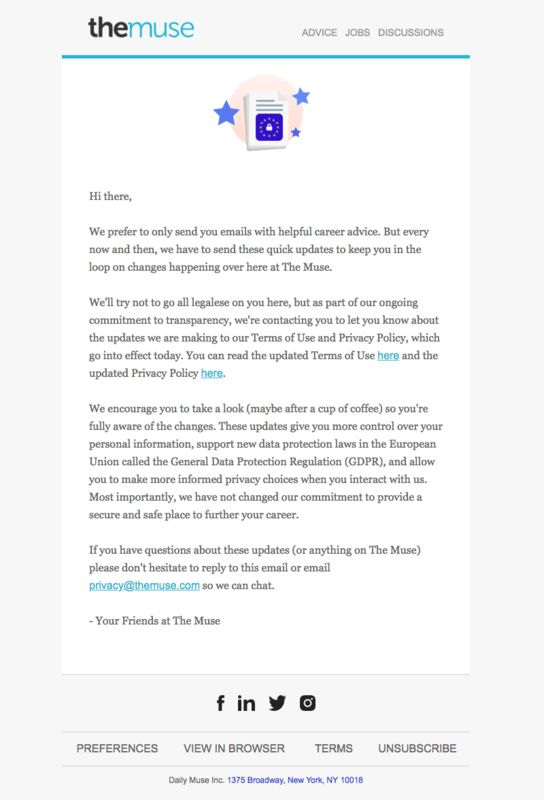 They fell into two main categories: (1) ones that notified readers of updates to privacy policies and terms of service, and (2) reconfirmation campaigns asking subscribers to opt-in. 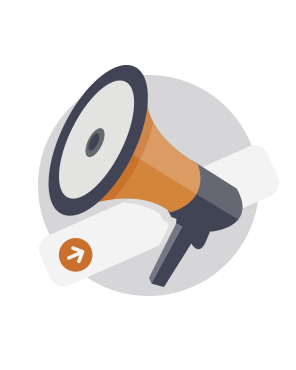 If you want to read more about GDPR, we included helpful links at the end of this post. 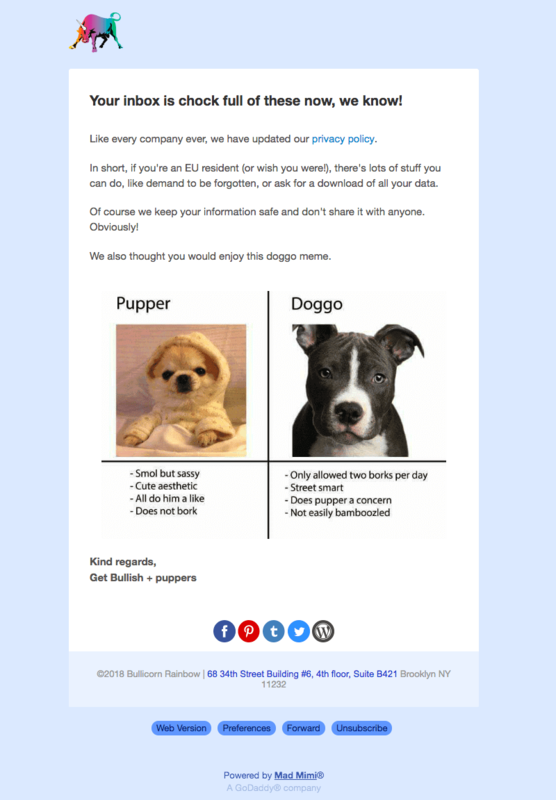 But, for now, let’s see how these GDPR emails looked. After all, good design means good communication, and when it comes to these “legalese” emails, this often goes a long way. Hinge does a really nice job of personalizing this email and making it super easy to read. The ultra-narrow fixed width, generously-sized text, and use of bolded, numbered sub-headers all converge to make this email super sleek and user-friendly. Coursera employs similar techniques as Hinge to make its email simple, ultra-readable, and well done. The “boxed” effect of the blue background border is a nice touch, too. Subject: Your trust is important to us. 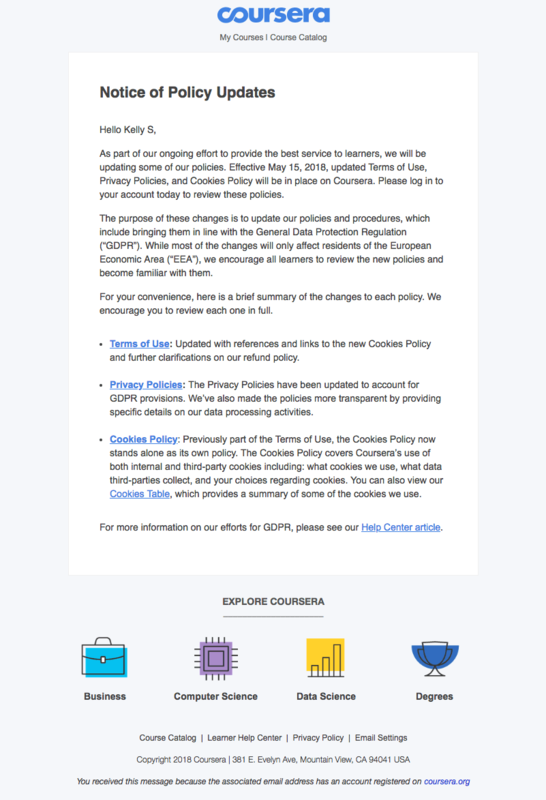 This is the only GDPR email we spotted that used a modular design with background colors to delineate information. It’s a great example of how a simple design tactic can improve comprehension, as readers see clearly labeled pieces of information one at a time. Here’s a great reconfirmation email from Your Majesty Co. that couldn’t be simpler. (You can probably guess the thing we love most about it.) 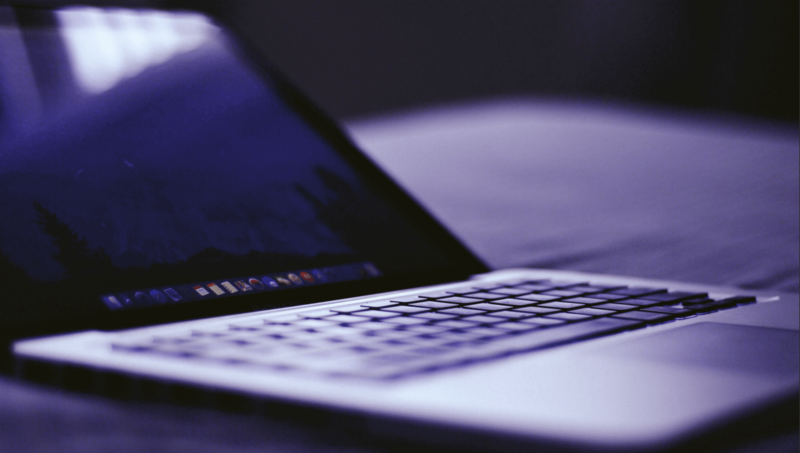 The purple bulletproof CTA button practically jumps off the page—it’s impossible to miss—which, of course, is the whole idea. This is a super friendly—if not wordy—email from The Muse that feels almost like it came from a buddy. To match the decidedly not cut-and-dry tone, the brand added an illustration at the top that incorporated the GDPR logo. We’re into it. Like Topo Designs, the hero image/banner in this Edenspiekermann email says it all. And this is even more important in a reconfirmation campaign that’s asking readers to act. Plus, Edenspiekermann incorporated artwork for each supporting article—a welcome invitation for readers to click. 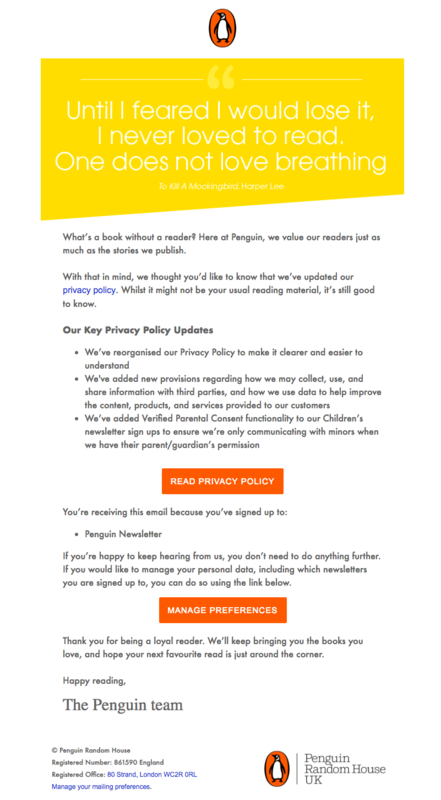 Leave it to the literary folks at Penguin Books to take their GDPR email to a whole other level. We’re into the Harper Lee quote and the opening line, which stands out as being more than a “We respect your privacy” opener! 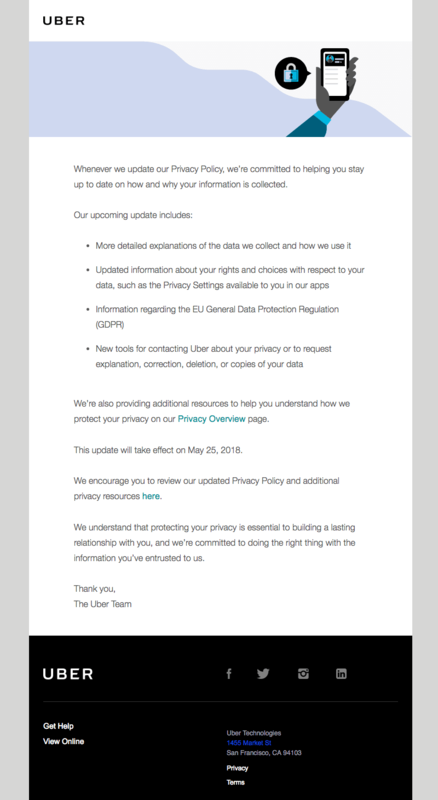 Like most of the emails in this category, Uber added a neat hero image to help convey its message, and we dig it! Saved the best for last! The elegant header in this Code Academy email looks great and communicates well—we love how the deadline was included (and the millennial pink, naturally). Sidetracked Magazine got a little playful here, and while the style isn’t for everyone, it is a breath of fresh air. Here, Reformation kept it short, sweet, and silly. 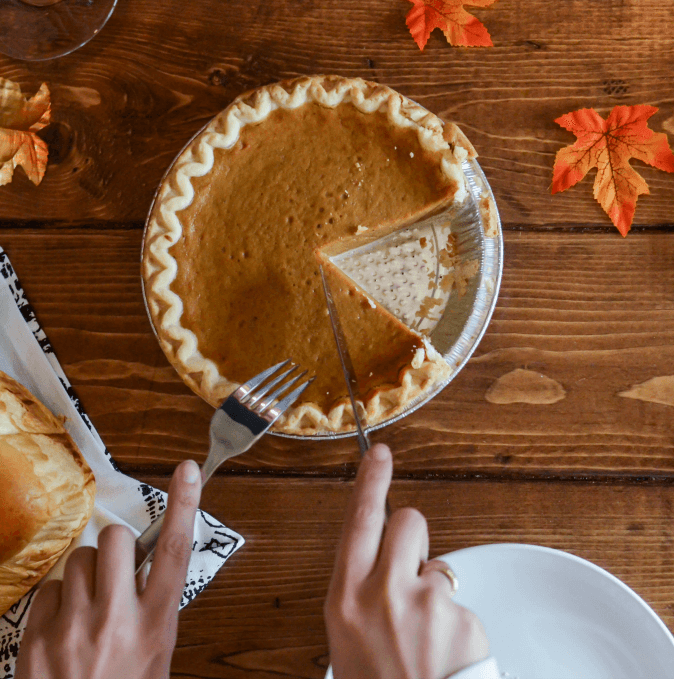 Hungry for more GDPR info? 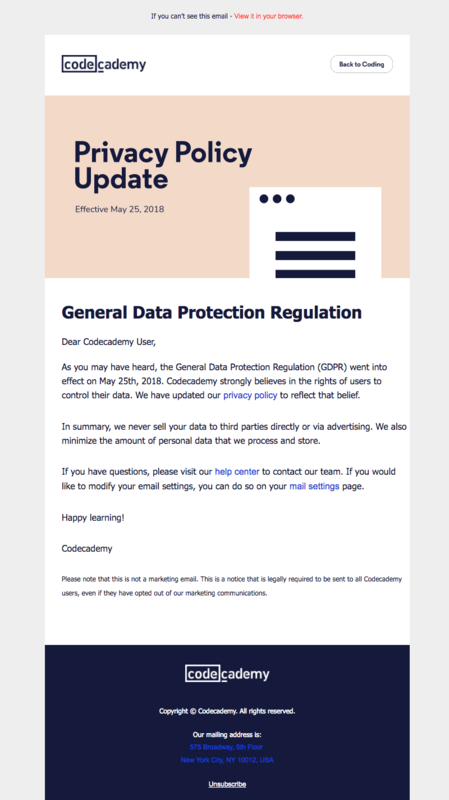 Here are a few GDPR articles we found useful! FastCo Design: What is GDPR and Why Should Designers Care? And, visit our GDPR Emails Pinterest Board for more design ideas!